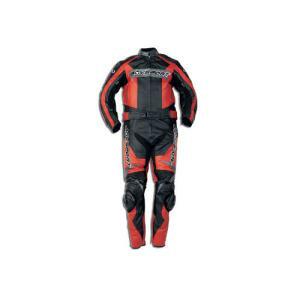 The AGV Forza two-piece leather suit from AGV Sport is made up of premium and durable 1.4mm cowhide and is double and triple stitched to ensure long lasting performance. The dual density armor in the shoulders, elbows, and knees is removable, and spandex is incorporated into the collar for improved fit and increased comfort. High-tech Schoeller Keprotec stretch panels provide maximum protection and durability, and a carbon textured aerodynamic race hump maximizes speed and minimizes wind resistance. For added safety and visibility, the AGV Sport badges are made of reflective material. It is available in black/red and black/yellow. There's also a 1-piece version available. This 2-piece leather suit would be a sleek addition to anyone's gear wardrobe. If one-piece street wear is more your style, here's a moisture-wicking option created by Alpinestars.